Saint Louis Brewery's statement said the company acted "immediately" after learning "in recent weeks that a senior executive had caused negative and misleading information to be circulated about 4 Hands Brewing Co.
Update: Schlafly and 4 Hands Brewing have released a joint statement in which Schlafly apologizes for "actions taken by one of its executives in an attempt to damage the company's reputation." 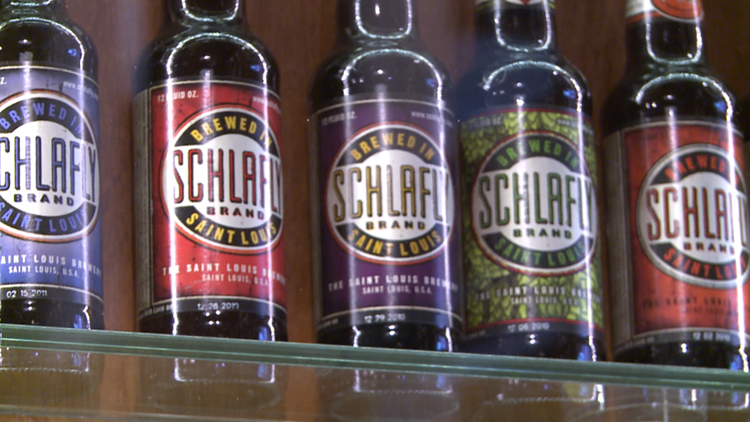 "We were embarrassed to learn of these actions and sincerely apologize to 4 Hands Brewing," St. Louis Brewery Chairman Tom Schlafly said. "Such actions are inconsistent with the core values on which we were founded and which have defined Schlafly for 27 years. The craft brewing industry in St. Louis was built by a closely-knit group of breweries that mutually respect one another. There’s no question that 4 Hands has earned its reputation for community involvement, civic pride, corporate responsibility, and inclusiveness." In the statement, 4 Hands President Kevin Lemp said, "We are grateful to have this behind us." ST. LOUIS BUSINESS JOURNAL -- The maker of Schlafly Beer on Friday admitted that one of its executives waged a campaign against a rival brewer's reputation. The admission from Saint Louis Brewery came after the Business Journal on Thursday made inquiries about a ghost-written newsletter that had been sent to bars and targeted 4 Hands Brewing Co.
"We were embarrassed to learn of these actions and sincerely apologize to 4 Hands Brewing Co.," Tom Schlafly, chairman of Saint Louis Brewery, said in a statement to the Business Journal. "Such actions are inconsistent with the core values on which we were founded and which have defined Schlafly for 27 years. The craft brewing industry in St. Louis was built by a closely-knit group of breweries that mutually respect one another. There’s no question that 4 Hands has earned its reputation for community involvement, civic pride, corporate responsibility, and inclusiveness." Saint Louis Brewery's statement said the company acted "immediately" after learning "in recent weeks that a senior executive had caused negative and misleading information to be circulated about 4 Hands Brewing Co. through a derogatory paragraph about the company in an anonymous newsletter mailed recently to local bars and restaurants, as well as deceptive online postings and a phone survey to local bars and restaurants in the first half of the year." It said the executive acted alone and has resigned. CEO James Pendegraft resigned effective upon the hiring of a successor, the Business Journal reported Wednesday. Saint Louis Brewery's statement Friday did not name the executive. Pendegraft has not responded to requests for comment.